The eleventh edition of Geneva’s Grand Prix d’Horlogerie delivered a rich and balanced overview of the current watchmaking industry despite the continued absence of some well-known companies. The Swatch Group, Rolex and Patek Philippe have not participated in the Grand Prix d’Horlogerie for many years. In a way this is really a shame, but in another way it does leave room for the jury to honor another side of watchmaking that has only recently begun to receive much-deserved accolades. Independent watchmaking continues to come out from behind the shadow of the rich and famous Swiss brands to reap the honors it deserves – as the eleventh edition of the Swiss city’s most prestigious awards demonstrated last night. 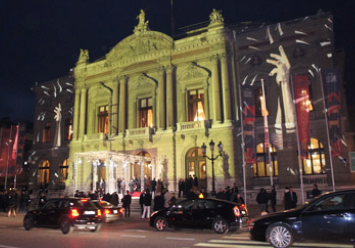 The 11th edition of the Grand Prix d'Horlogerie de Genève took place in Geneva’s regal Grand Théâtre, illuminated by Gerry Hofstetter. A reorganization of the foundation overseeing the GPGH has resulted in an enlarged jury that now includes three world-renowned retailers and distributers, journalists, experts and even collectors as well as a system of secret voting that enables even the most timid jury members to speak their minds. The new jury also comprises representatives of the city and canton of Geneva, Timelab (which oversees the Seal of Geneva) and the MIH – the Musée International d’Horlogerie in La Chaux-de-Fonds, one of the most important cultural institutions in watchmaking. Ninety-one brands submitted a total of 246 watches to seven jury-presided categories, which voted them down to a top ten in each category, before shortlisting the top three, with the winning watches announced last night. The ceremony – as usual – began right on time. The mayor of Geneva proclaimed an abundance of creativity and tipped his hat to the “artisans and creators making these complicated things we love”. The design category was hotly contested, in addition to being completely misnomered. From the final three – Eva Leube’s incredible Ari, Hautlence ’s awe-inspiring HL 2.2 and Urwerk ’s intense UR-110 – the jury chose a highly deserving Urwerk . In voting the ladies’ category, it became evident that the jury had no women on it. Boucheron took home the trophy for its gem-studded oeuvre Crazy Jungle Hathi. Though it was nearly impossible to know where the difference in these two categories lay, the one labeled “jewelry and métiers d’art” came away with a most deserving champion: Van Cleef & Arpels’ Lady Arpels Polar Landscape Seal, which features an artistic mélange of engraving, enameling and stone work. The hotly contested category for men’s watch of the year was also a tossup in terms of quality and ingenuity, but the jury went for poetry in the end, awarding the honor to a deserving Hermès Arceau Temps Suspendu. With a push of the button, this manually wound watch hides the time and the date, thereby allowing its wearer to enjoy life without the pressure of worrying about the time. Not greatly surprising, TAG Heuer took home the award for best sports watch: the Mikrotimer Flying 1000 Chronograph. Sebastian Whitstone, president of the GPGH jury, personally handed the award for the best complicated watch to Jean-Frédéric Dufour, CEO of Zenith, for the Academy Christophe Colomb Equation du Temps. Dufour explained that this was one of almost 300 awards Zenith has received throughout the company’s history and cited the reliability of its timepieces. The Petite Aiguille for the best watch priced under 5,000 Swiss francs went to Montblanc for the Star Worldtime GMT Automatic. The Prix Publique (Public Prize), which was voted on by visitors to the GPGH traveling exhibition in four major cities (Zurich, Hong Kong, Shanghai and Geneva), was given to Audemars Piguet for its Millenary 4101. CEO Philippe Merk was visibly pleased as he accepted the trophy for this innovative timepiece. The jury also presided over three special categories. The Patek Philippe Museum won the Special Prize of the Jury, which can be awarded to any person or entity within the realm of horology. The best watchmaker-concepteur award went to Vianney Halter, who received it from MIH curator Ludwig Oechslin. “Watchmaking has been a voyage,” Halter said, comparing the realization of a timepiece to a journey. He described himself as an explorer, but also took time to thank those that have influenced his path, among them Pierre Maillard, Philippe Dufour and Robert Greubel. Vianney Halter accepts his award for best watchmaker-concepteur of the year with a passionate speech about his journey. The last award of the evening was simultaneously the most anticipated: Robert Greubel and Stephen Forsey, who won the Aiguille d’Or last year for their eponymous brand, personally handed it to this year’s recipient of it. De Bethune was called to the stage amidst grand applause. In receiving the award, technical director Denis Flageollet described the independent scene as “a grand horological family.” He also described the goal of the brand he founded together with David Zanetta as striving to “search and move forward.” Zanetta said that “watchmaking is an art and a science at the same time. The goal is not to make more watches, but to make better watches.” In his acceptance speech, De Bethune co-founder Denis Flageollet paid homage to absolutely all the crafts involved in a final watch. The glorious evening was closed by a speech from Swiss president Micheline Calmy-Rey.